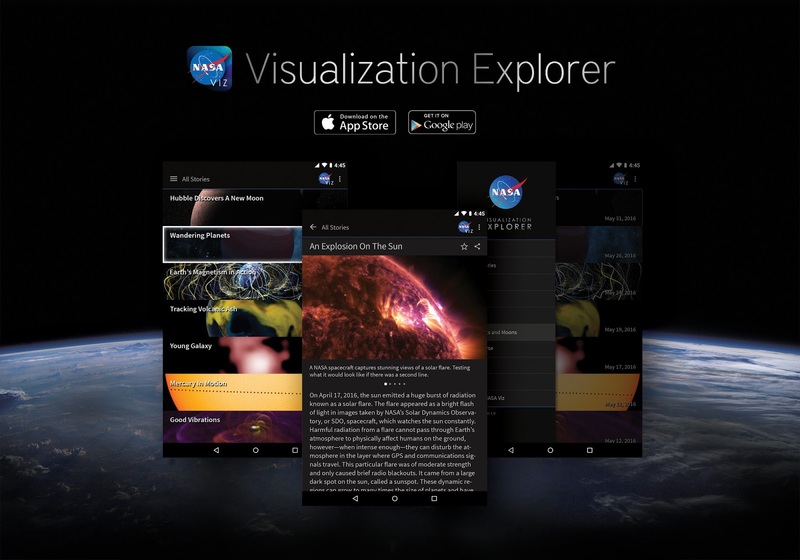 The NASA Visualization Explorer App is now available to users with Android devices running version 5.0 or higher. The app features data visualizations developed by NASA's Scientific Visualization Studio, Earth Observatory, Science@NASA and others, that show current research from NASA's study of Earth, the moon, the sun, our solar system and the universe beyond. Stories are released every other Monday, and with the Android version release, put NASA's exploration of our world and universe into the hands of more people with a smartphone or tablet. Each story features a high-resolution movie or still image and short text to put it into context. Recent features have included viewing the world's carbon dioxide in 3-D, erupting water plumes on Jupiter and the path of this summer's total solar eclipse across North America. Originally launched in 2011 for the iPad, the app became available on all iOS devices in 2014. User requests prompted development of the Android version, which will run on Android 5.0 and higher. The current release is a beta version, and while users do not yet have all the features of the iOS versions, they will be able to browse all 525 current stories, receive new stories and share them via social media. NASA is looking forward to receiving input from users as we continue refining the Android version. Users can send feedback in the main menu of the app or through the developer email found on the NASA Viz App's Google Play webpage.